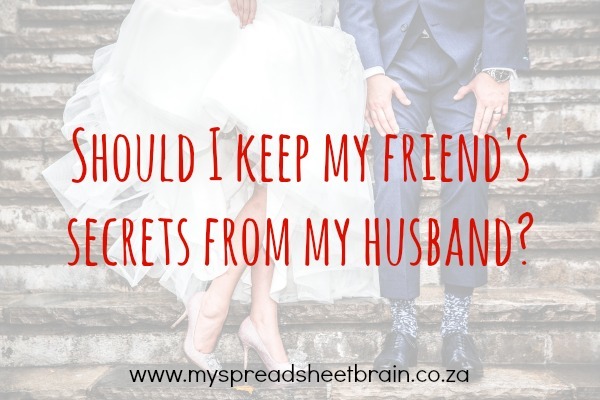 Do you keep your friend’s secrets from your husband? I’ve only been married for a few seconds (give or take 4 years) but few things have baffled me about marriage the way this dilemma does: Should I be telling my husband my friend’s secrets? We know that marriage is built on foundations of trust, mutual respect and open communication. But is there a line that must be drawn when it comes to sharing information with your spouse? Wives, please tell me, do you keep your friend’s secrets from your husband? Many wives (it seems men don’t have this problem, yo) feel that confidence trumps everything else. They say: “If my friend asked me to keep it on the down low, then that’s exactly what I’m going to do! But one wonders if the same rule should apply if you are married since spouses should not have secrets from each other. Right? What happens if the secret has to do with a health ‘life-or-death’ issue, and you are physically and emotionally unable to deal with it on your own? Or what if the secret has to do with unlawful activity and you need advice? What if the secret is about your friend’s infidelity in her own marriage? Does keeping the secret (especially from your own spouse) mean that you are in agreement with your friends actions? Where does one draw the line? For Hubstopher and I, we seem to have a pretty standard way of dealing with things like this. Well, for starters, I know that he is a safe place (and I hope he feels that way about me too) – so our conversations would usually NOT leave our safe place. What happens in Vegas, and all of that. But with that said, if Suzy told me about her messy argument with her husband, chances are I won’t be repeating it to my Hubstopher. Why? Well, because it doesn’t involve him. There are no consequences to him knowing OR not knowing. And, to be honest, he wouldn’t care either way. It is an unspoken approach that I’ve taken when it comes to private conversations. If speaking to him about it wouldn’t change anything (and won’t offer me any form of release except the gossiping sort) then why tell him? But if Suzy told me about her plans to divorce her husband, I might confide in my Hubstopher about that. Chances are Suzy would be coming to me for advice and I honestly feel ill-equipt to be dealing with something that intense on my own. Or if Suzy told me something that affected the way I feel (perhaps she got the top-secret promotion that I had been vying for) then I would probably open up to my Hubstopher, to let him know how I feel about it. I mean, if I’m going to ugly-cry, I’ll only do it in front of him. And if I’m going to be a mean girl and say mean girl things, I’ll probably only say it to him. Because I know he’ll love me either way AND he’ll correct me, if I need correction! What do you guys think? Is this the right way to do things? Should I be keeping #allthesecrets from my husband because I was asked to “not tell anyone”? Or do you think that your girlfriends should JUST KNOW that some secrets are not husband-avoidable. Share your thoughts in the comments section! We have a very similar approach and when a friend shares something I feel I’ll need to off load or share with my hubby-then I tell her that I’ll be open with my hubby and that it’s completely safe with him, because essentially we are “one”. If she has a problem with that then I will spare him the embarrassing details but will still share the essential issue and be open. I find that if I’m transparent with him and trust him as my safe space then he is able to trust me as a safe space as well. What’s so funny is that I’ve asked him to emphasize when he’s telling me something confidential to say so because I can be a impulsive and have to put a lock on the information as it’s being given. I’ve improved considerably I’ve the 13 years of marriage and we are definitely healthier for it. Plus he comes first before a friendship, so building our safe space with transparency seems healthy to me. Also because forgiveness and trust are built there as well-it’s not easy but it’s healthy. I agree with you on this “I will spare him the embarrassing details but will still share the essential issue and be open”. I think it depends on what the secret is, most things I keep from my husband, because it’s shoved off as girl talk. But if it’s something that is a HUGE concern to me, I would tell my husband to get his take on things but I won’t discuss this with my friend and tell her my husband said this.